Anyone who wants to get to the point quickly need experience! The digital revolution is no add-on, but also imperative in order to be able to successfully place your company in the market for the future. As one of the first digital and content agencies in the country, we recognised this aspect at an early stage. In the early 2000s, we already helped many clients prepare for the digital revolution. In 2004, Tommy Hilfiger was one of the first fashion companies that dared to take the step into the e-commerce business with our know-how. After that we were able to gain brands such as Marc O'Polo, Tom Tailor, Mustang, Seidensticker, Engelhorn or Peek & Cloppenburg in a short time. Even Zalando was live on the scene only 4 years later. A variety of digital services emerged from this. Especially when they come from us. A good photo or a good film is indispensable for modern sales and to an extent replaces the salesperson in classical trading. Just like in this realm of trade, there is poor and good quality in the photo & film sector. It is better for you to decide on good quality! ...and we have made quite a few in the past 20 years. But we have never made the same mistake twice! In the sphere of e-commerce, we have unfailingly covered and tested every sector and implemented activities in the form of a success-sharing model for clients. 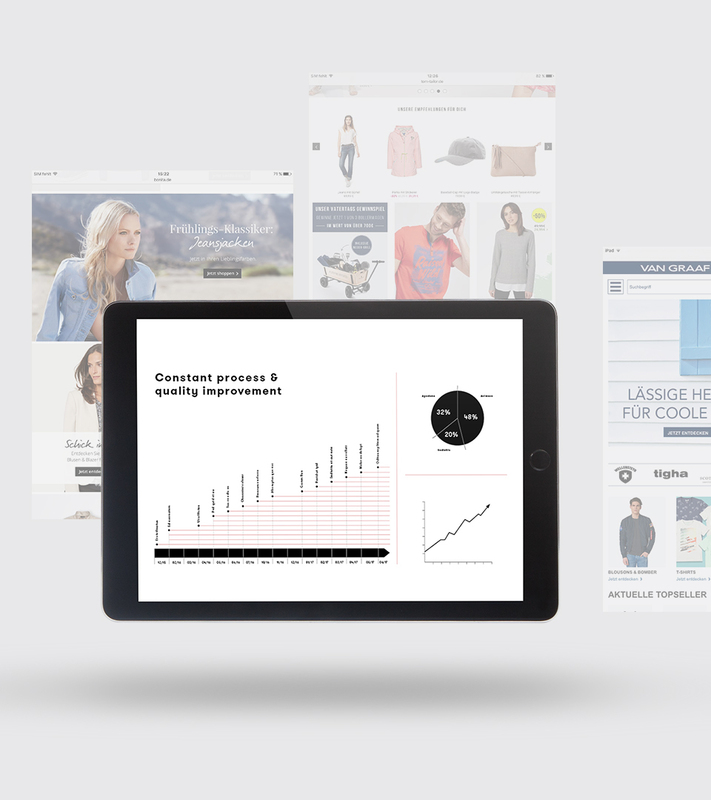 Are you still considering what you can optimise in the desktop version of your shop? Then leave the competition miles behind now! What seems modern to you today is already completely obsolete tomorrow. If you do not permanently invest in the RIGHT technologies, you will be quickly overtaken on all sides. This particularly applies to companies which you do not regard as competitors. We can not only show you which technologies you should rely on, but also what they may cost. Not only sounds good, also looks good! Good storytelling counts more than ever today. This means no success without a good story! And what would such a story be without a good image. For over 20 years we have been working exclusively for fashion and lifestyle brands – image plays a superordinate role here. So, we know what looks good and attracts customers.